When you're ready for an adventure of a lifetime, then step inside this Jayco Eagle HTX 26BHX fifth wheel! It features a set of double bed bunks in the rear that your kiddos are sure to love, and you will love having a front private bedroom to escape the chaos. You won't need to worry about any run-ins thanks to the double entry doors promoting a smooth flow of traffic in and out of the unit. When you're ready to wind down the night, head into the entertainment center and lay back on the tri-fold sofa. You can even add the optional fireplace to complete the ultimate relaxation! In any Jayco Eagle HTX, you will find a fifth wheel to give you generations of family fun and a peace of mind! The climateshield is an ultimate weather protection that extends your camping season. It is designed for efficient heating and cooling, plus it protects against extreme heat or extreme freezing. 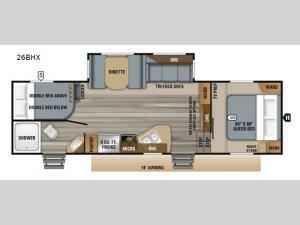 You will love all of the luxurious features these Jayco Eagle HTX fifth wheels offer! From the LED HDTV with a full digital HDMI output and the 12V AM/FM/CD/DVD/USB A/V system with Bluetooth to the LED lighting throughout. They even have a keyed alike lock system and prepped for a backup camera. No one offers a better warranty than Jaycos 2-year limited manufacturer's warranty to cover you for 2 whole camping seasons and the only strings attached are those that deliver the ultimate in reliability.